Chinese New Year is just around the corner. My wife started making cookies and snacks for Chinese New Year. She makes cookies and snacks at night after taking her dinner. Although she is busy with her daily work but she enjoys making cookies and snacks because my son is celebrating Chinese New Year with us this year. He was in South Korea last year and didn't come back during last Chinese New Year. However, my other son can't celebrate Chinese New Year with us this year. He is in oversea. The snack that she already made is seaweed snack. The ingredients of seaweed snack are seaweed, popiah skin and egg white. Making of seaweed snack is very simple. First, use a clean pastry brush to paste the seaweed and popiah skin together with egg white. Then, cut it into small pieces (2cm x 5cm). Finally, fry the stuff until the popiah skin turns light brown. 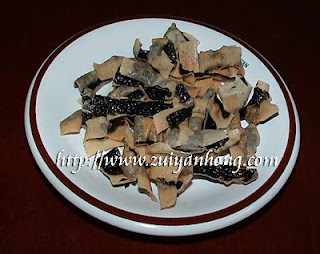 After cooling, the crunchy seaweed snack is ready to put into your mouth. The seaweed snack is so crispy and tasty. I can't stop taking it with a glass of beer when enjoy watching television after blogging. Thank you so much. I was looking for the recipe high and low and will making it today. Thanks for sharing.